BRIDGETOWN - The Barbados-based Caribbean Development Bank (CDB) will establish its first country office in the Republic of Haiti later this year. Minister of Foreign Affairs Antonio Rodrigue and the Bank’s Vice-President (Operations), Monica La Bennett, recently signed the Country Agreement to pave the way for that to become reality. La Bennett said the signing of the agreement further cements the strong partnership between CDB and Haiti. “Last year, CDB, in collaboration with the Government of Haiti, developed a country strategy plan for the period 2017 to 2021, with an indicative resource envelope of US$100 million to help Haiti meet its development priorities. The strategy focuses on three main themes: agriculture and community development, sustainable energy development and education and training. It is this deepening engagement between CDB and the Government of Haiti that has led us to conclude that there is a need for a country office,” she said. Haiti became a member of CDB in 2007. Since joining the Bank, the country has been allocated grant resources from CDB’s most concessional resource pool, the Special Development Fund (Unified). In 2017, an allocation of US$45 million was approved under the ninth cycle of the Fund. To date, a total of US$133 million has been committed to Haiti. Projects supported included the Education for All Phase II Project; the Technical and Vocational Education and Training Project II; interventions in agriculture and rural development; technical assistance for micro, small and medium enterprise development, and improving the quality of, and access to basic education. CDB’s ongoing work in Haiti includes projects in education, including technical and vocational education and training; climate resilience; and community-based agriculture and rural development. In addition, since May 2013, the Bank has paid the country’s insurance premiums to CCRIF SPC. The payments cover Haiti’s earthquake, tropical cyclone and excess rainfall policies. Under this arrangement, the country has received three major payouts, most recently following the passage of Hurricane Matthew in October 2016. 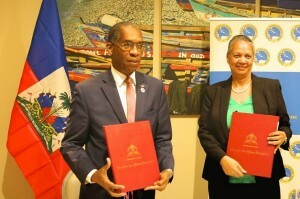 Photo: Haiti’s Minister of Foreign Affairs, Antonio Rodrigue (left) and Vice-President (Operations), Caribbean Development Bank (CDB), Monica La Bennett (right), hold the signed country agreements.